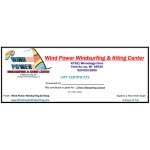 This gift certificate is targeted for a beginner kitesurfer, taking a winter lesson. This is a one on one lesson for safety reasons. Kite and board supplied by Wind Power, student provides recommended safety equipment. Helmet is mandatory. Snowmobile, motorcycle, BMX bike or ski helmets are acceptable. We highly recommend snowboarders have knee pads.